The Town of Winchester chose a CON/SPAN® bridge system as a low cost, low maintenance, speedy alternative for the Turtle Lake crossing. 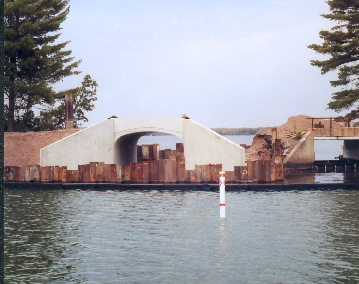 The replacement structure is a roadway over the connection from North Turtle to South Turtle Lake which provides access for many boats between the two lakes. The project was a true community effort between the Town of Winchester, the Lake Association and Vilas County. Volunteers donated both time and money to enhance the landscaping and the grounds of the area after the CON/SPAN was placed. With quick and easy installation, the CON/SPAN was set in place in 7 hours.